When you rely on iTunes to manage your music collection and all of the apps and files you store on your iOS device, its library can quickly become unmanageable…and Apple doesn't like to give you a whole lot of control over how you organize it. Enter iTunes Library Toolkit, a handy PC-based application that offers you control over at least part of your iTunes library. 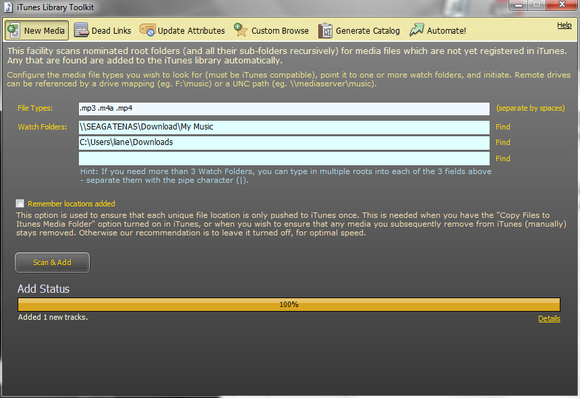 iTunes Library Toolkit's interface is a bit plain, but perfectly easy to understand. 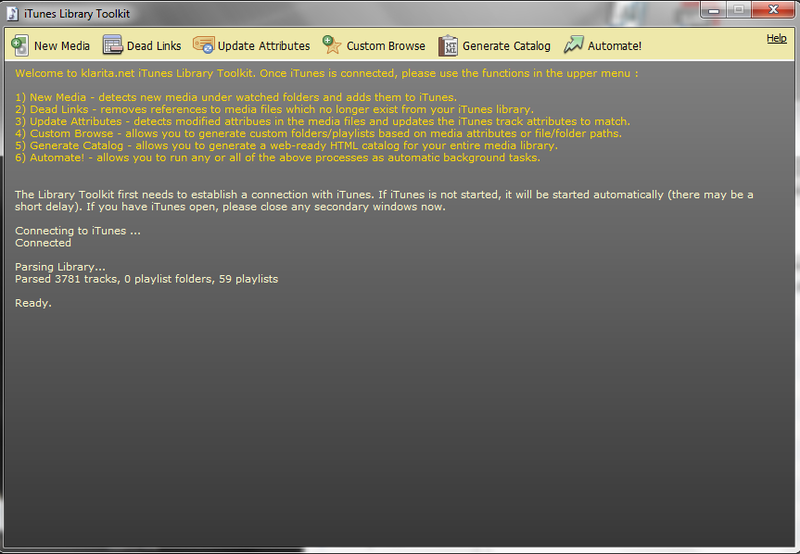 ITunes Library Toolkit is free to try for one month. After that you'll have to pay 3.5 Great Britain Pounds ($5 as of 6/12/13) for a one-year license. And it is the kind of application that you'll want to use more than once, as its goal is to offer "ongoing maintenance of your iTunes Library." To that end, it allows you automatically add new media files to iTunes, remove dead links from iTunes, and update the metadata on iTunes files. ITunes Library Toolkit is a newer application from Klarita, which also offers a similar program called iTunes Folder Watch. iTunes Folder Watch serves one dedicated function: Adding new media to iTunes from watched folders. iTunes Library Toolkit offers this feature, too, but without some of the finer-tuned controls that iTunes Folder Watch offers, such as the ability to manually override any additions. Setting up watched folders is easy, and iTunes Library Toolkit will scan for and locate tracks to add to iTunes. Removing dead links—those references to files that no longer exist—is easy, and I was surprised to see how many iTunes Library Toolkit was able to clean up for me. I do wish the application let you preview the links before you removed them, instead of after the task has been handled. ITunes Library Toolkit does check to make sure it is not misidentifying live links as dead ones, though, and it made no errors in my tests. Music aficionados will appreciate how iTunes Library Toolkit can automatically update the track attributes to match the track tags in the song files, and how it can generate a Web catalog that allows you to share your music collection with friends. This Web catalog doesn't actually share music files. 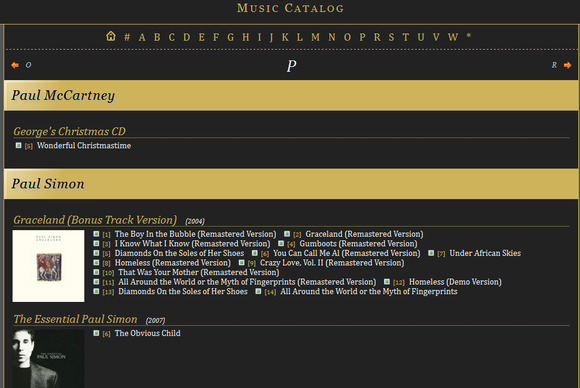 Instead it generates an HTML file that lists the albums, artists, and tracks in that library. The Web catalog is a file that someone else could read in order to get inspiration for their own music library. iTunes Library Toolkit is an inexpensive tool that will help keep your iTunes Library tidy.